What is 6G Mobile Technology? In February 2019, the term 6G suddenly made a buzz around the world when the president of United States, Donal Trump tweeted that he wanted "5G, and even 6G, technology in the United States as soon as possible." While the world still waiting for 5G to be introduced, everyone wondered what is 6G technology. In simple words, 6G will be the Sixth Generation of Wireless Technology. In fact, 6G technology hasn't even been defined yet, though the researchers defined 6G as the sixth generation of wireless service that will feature terahertz frequency networks and spatial multiplexing. To do this an unprecedented level of network densification will be needed, with base stations miniaturized and embedded all around us. This will make it possible to have hundreds and even thousands of simultaneous wireless connections with as much as 1000 times higher capacity than what we expect with 5G service. Finally, while 5G applications are expected to revolve around a single-beam approach to data transfer, 6G could be designed around hundreds of simultaneous beams, yielding much higher data rates. Research groups consider it as an ultimate replacement of 5G’s which could be in commercial use within the next decades. It is still a long way away so the applications of 6G technology are hard to imagine. Many also believe that 5G will use multiple forms of connectivity and if done right there will never be a need for a 6G. Still, 5G is only just becoming a concept now the 6G wireless system is not coming anytime soon. ECE and CSE students should select this concept as a good seminar topic on future technology. It will be interesting to learn about this next-generation of communication while understanding the concept of 5G technology and the current mobile wireless network technology (4G). Here we have uploaded a paper to give an idea on this seminar topic. 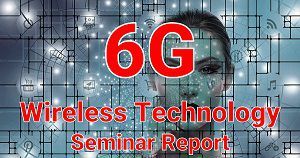 You can do some more research and make a good seminar report on 6G wireless technology. The papers for the seminar report explains the evaluation of cellular and mobile communication at an available of different technology in International Standards.